This concept is what makes our brand of racing so unique, exciting and fast! It has been almost 40 years since Jim Shampine introduced what has become the prototypical supermodified: the radical offset 8-Ball. What made this racecar so unique is that Shampine took a concept that many builders were toying with since the early 60s and took it to a winning extreme. That concept is offset. I think, as fans of supermodified racing, we all know what offset is. All you have to do is look. We’ve got big block motors that are offset 18” to the left of the center-line of the racecar and some car builders will even shift the entire chassis, with respect to the axles, to the left. That’s a lot of offset and it’s easy to spot. This concept is what makes our brand of racing so unique, exciting and fast! But, let’s ask the question: “how does offset make a supermodified the fastest short track car on the planet?” Well, if you are a follower of The Bogwan and our little pit-side chat, you will know that virtually everything done to a supermodified is to optimize weight transfer and thus optimize the grip of the tires as the racecar corners. Optimized tire grip equals fast cornering speeds. To start our discussion, let’s look at Figure 1. This depicts what I will call an “old school upright” supermodified of the 1960’s that weighs in at 1800 lbs. The engine, driver and rear end are all along the center-line of the racecar. With no offset (and standing still), each tire shares the 1800 lb load equally at 450 lb. 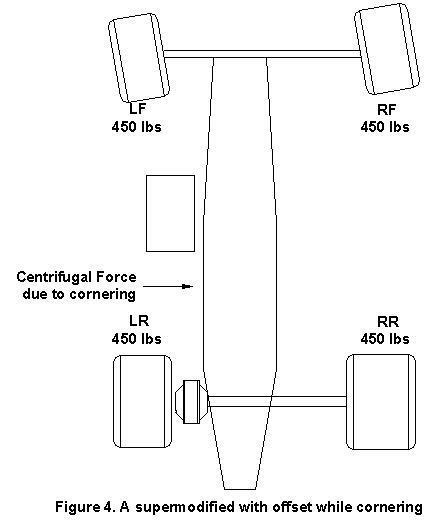 In Figure 2, this same supermodified, while corning, will transfer weight due to centrifugal force, from the left side to the right side. This is the law of physics. 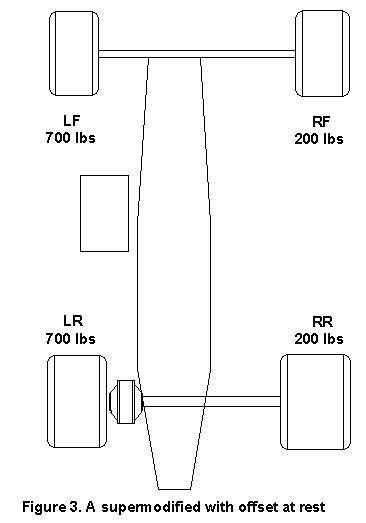 Note how the transfer of weight “unloads” the left side tires (450 lbs to 200 lbs) and “loads” the right side tires ever further (450 lbs to 700 lbs). With no offset, the super in Figure 2 is under-working the left side tires and over-working the right side tires while cornering. The result is not the ideal grip that we are looking for. If you think about it, this car has an optimal weight distribution while standing still! Racecars are pretty while standing still, but we want to fly around the race track at “holy s***” speeds! So if the non-offset “upright” supermodified transfers about 500 lbs from LF to RF and 500 lbs from LR to RR, and this weight transfer is hardly perfect, then what do we do? The surprisingly simple answer is to start out with an extra 500 lbs on the LF and RF by offsetting the weight of the components that make up the supermodified. 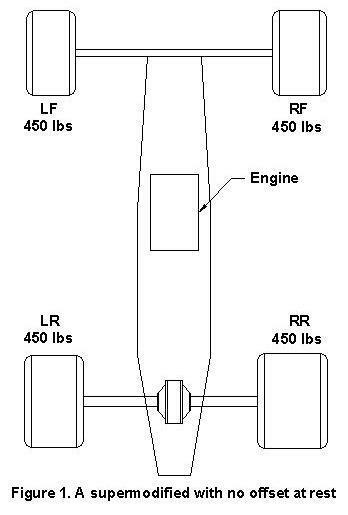 By offsetting the engine (the heaviest single part of the racecar) and even the entire chassis to the left, we can achieve the weight distribution found in Figure 3. Note how the left side tires have much more weight on them, at rest, then the right side tires. 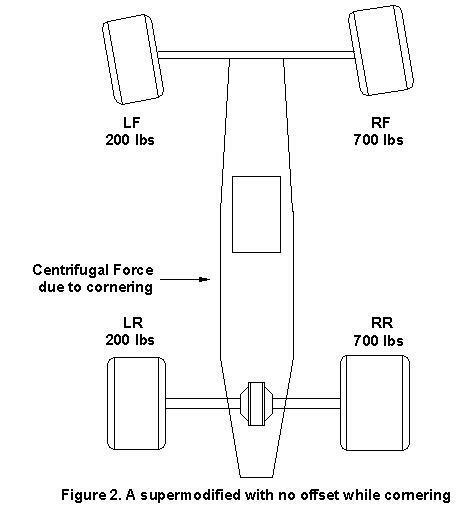 This weight offset really comes into play while the racecar corners at speed as shown in Figure 4. Each tire is being worked equally and we have achieved optimum grip. You can’t tell by the picture, but this car is going REALLY fast! It might even win the International Classic. The elegance of Jim Shampine’s racecars is that he took the same parts and pieces that his competition was using and simply re-arranged them into a simple, yet revolutionary supermodified. I’m not sure, but I’ll bet that Jim’s original radical offset supermodified will be pacing the field at some point during one of the races for the 59th Annual International Classic weekend. So when it does, give a cheer and say a prayer as you remember the originator of the radical offset supermodified. As I do every International Classic 200 weekend, party hard, party SAFE, and please don’t drink and drive, but always cheer loud because the drivers can hear you! Thank you for your questions about supermodified technology. If you have something you’d like to see covered in a future Supermodified Tech Knowledge column, you can contact me at motosports@groupRtech.com. Follow me @groupRmtrsports and submit questions via Twitter as well. The Bogwan is adjusting his static weight. If you’d like to know why he loves “Hanging to the Left-Supermodified Style” you can ask him by leaving a comment below or take a moment to Hit the Wailbag. He’ll have your answers after he makes it through the corners of Classic Weekend. 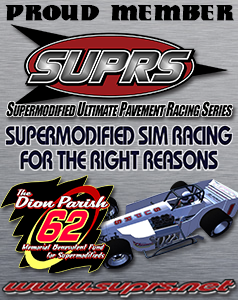 This Supermodified Tech article is brought to you by Venom Elite Chassis and Motorsports. “The Future of Superior Chassis Design.